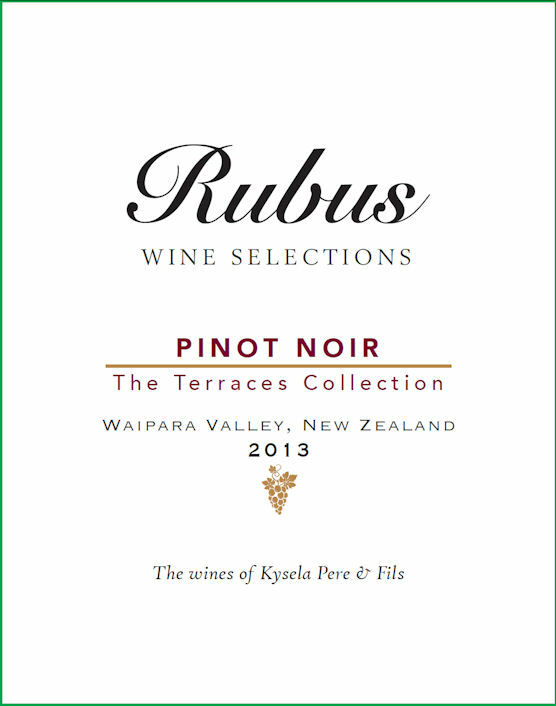 The newest addition to our Rubus family, The Terraces Collection Pinot Noir, is in the house! Rubus is a private label created and used by Kysela Pere et Fils, LTD in order to buy, bottle and market wine found at an incredible quality/price ratio. Over the past few years it has become an international brand, encompassing wines from various continents, all of which are hand selected by Fran Kysela MS. This 100 % Pinot Noir from the Waipara Valley of New Zealand is made by Sherwood Estate winery. It's made from clone types D 113, D 777 & UCD 5 (Pommard Clone). The Pommard Clone is the most planted Pinot clone in Oregon and is often responsible for intense red or black fruit aromas. Rubus Pinot Noir has been aged in a selection of Sherwood's best barrels. This Pinot Noir displays rich berry fruit and plum aromatics supported beautifully by oak complexity. The palate is full and round with texture and impressive length in the finish. It's great with red meats, such as hearty lamb, and full-flavored white meats. Dark cherry and crushed berries lift from this dark tooth staining juice. On the palate the wine is weighted, full-bodied. Silky smooth and refined with flavors of plum, cherry and hints of toasted oak. The integrated tannins flow smoothly to a lengthy finish with slight hints of spice and plum.